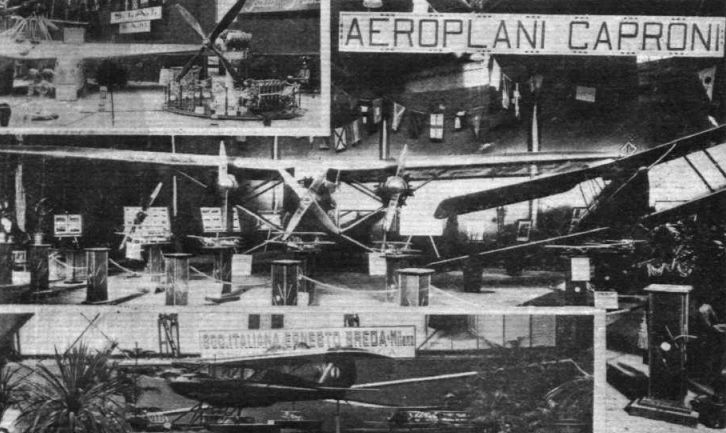 AT MILAN AERO SHOW: The combined exhibit of Isotta Fraschini, S.I.S.A. 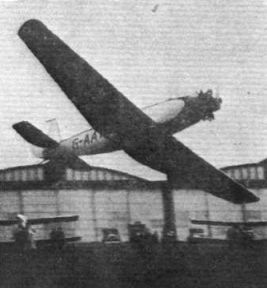 (the Savoia 55 flying-boat), and S.A.M. Air Lines. "STRANDED": An aerial view (from Bush House) of the "Spider" which was exhibited all last week in the Strand by Shell Mex, Ltd.
A NEW VENTURE: Capt. 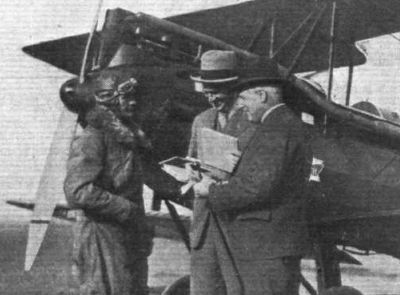 Stack standing alongside his "Hermes-Moth," the property of S. Smith and Sons for whom he is now flying. 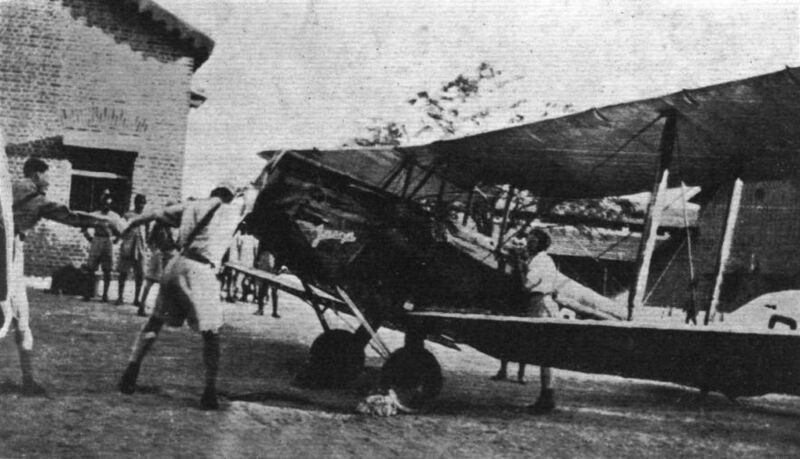 At Jhansi: An officer helps to start Miss Johnson's engine. Packard Diesel engine installed in Waco machine. A Boeing 3-engined (525 h.p. Pratt & Whitney "Hornet") cabin 'plane employed on the Chicago-San Francisco air service. It has accomodation for 18 passengers. As will be seen, these machines have to fly over mountain range on certain sections of the route. 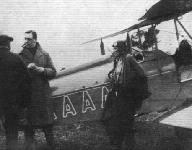 THE LATEST "AUTOGIRO": Fitted with an Armstrong-Siddeley "Genet Major" engine, this machine is characterised by a rotor of somewhat different design, with larger blades and lower speed. The performance has improved in various respects, and altogether this latest type is said to mark yet another step forward in the evolution of a very interesting aircraft type. 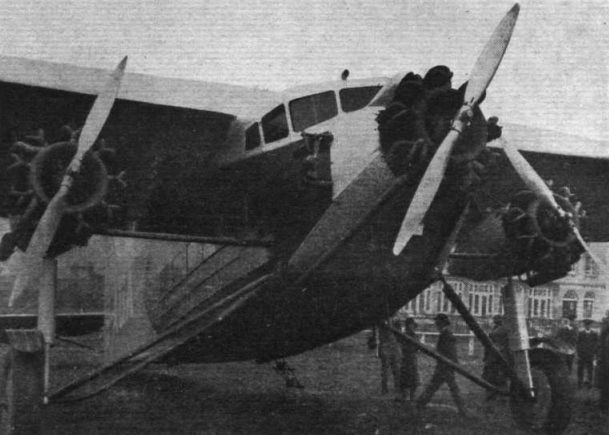 The "Late 28-3" seaplane which will be used on the South Atlantic section of the France-South America air service. 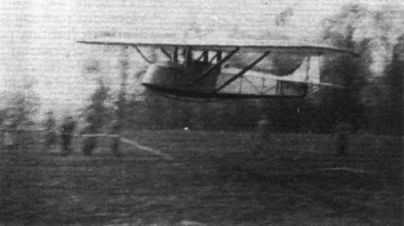 Front and flying views of the "Late 28-3" seaplane. 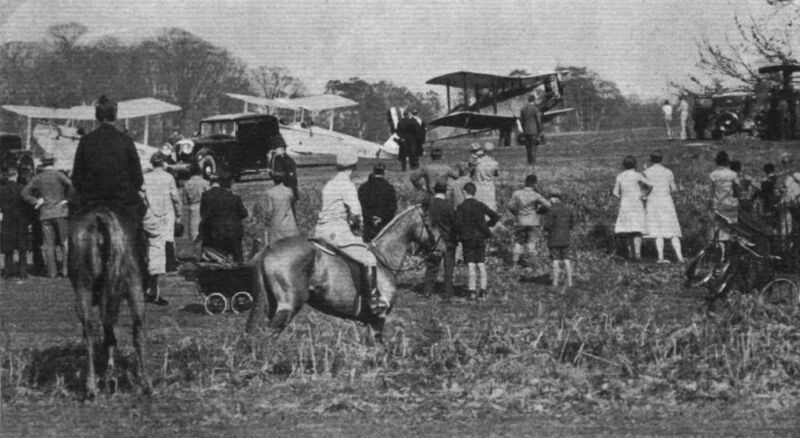 THE PRINCE OF WALES ARRIVES BY AIR AT WINDSOR: The Prince flew from Marseilles in a Westland "Wapiti," piloted by Sqdn.-Ldr. Don, which is seen in the centre of our picture, the Prince being in the group standing by the car on the right. 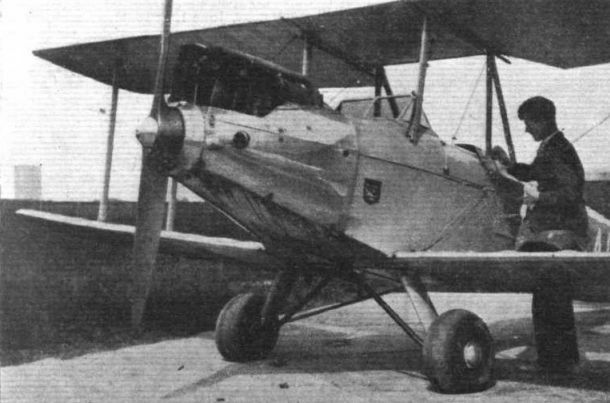 THE "AVRO TRAINER": Three-quarter Front View. The Fabric Fairings are made as detachable units to facilitate inspection of the Fuselage Structure. 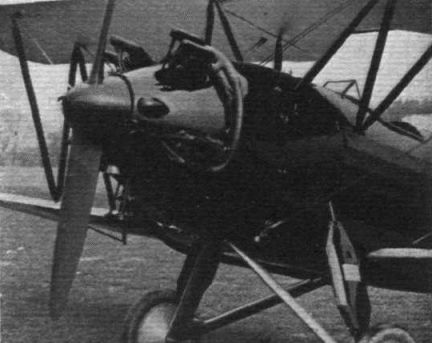 The Nose of the "Avro Trainer" fitted with "Mongoose" engine. An alternative power plant. 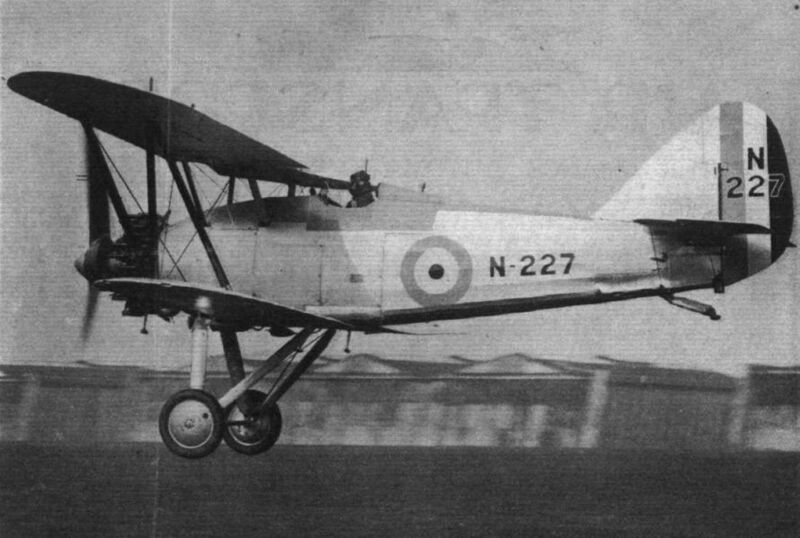 The "Avro Trainer" fitted with "Lynx" engine. 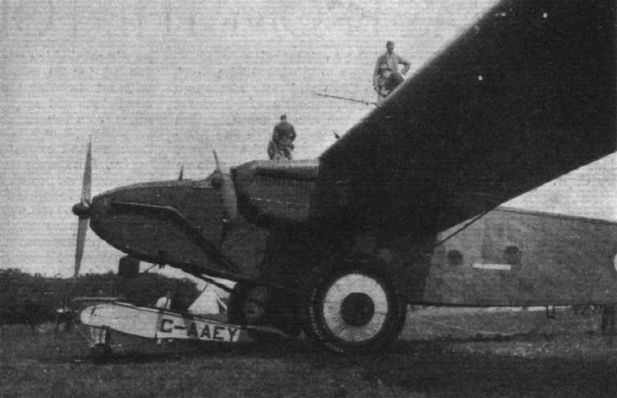 THE "AVRO TRAINER": The front view gives a good idea of the wide track of the undercarriage. 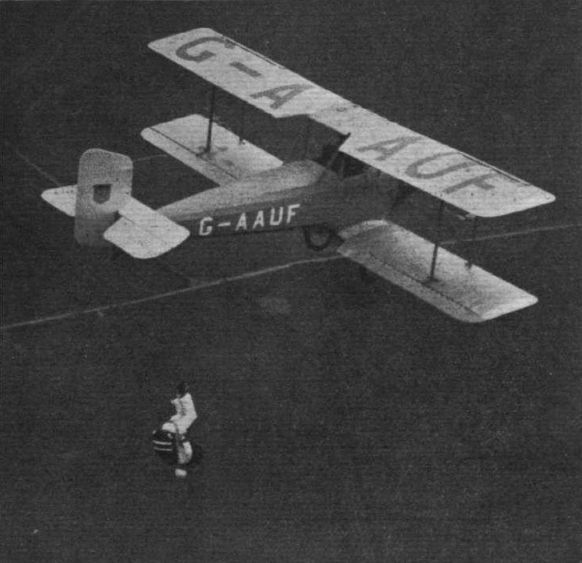 THE "AVRO TRAINER": In this three-quarter rear view, possibility of jumping by parachute from either cockpit is well brought out. 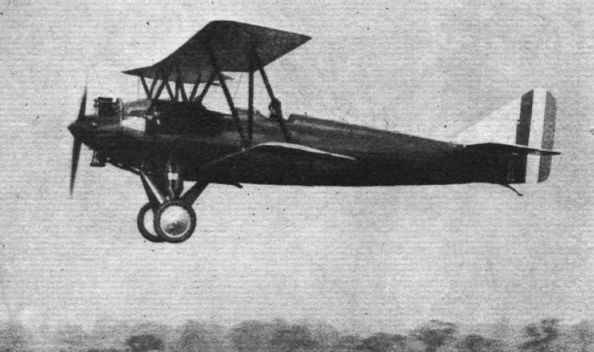 THE "AVRO TRAINER": The machine in flight. 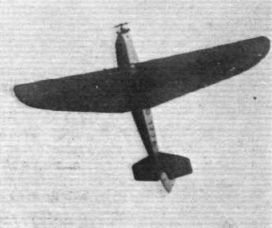 The "Avro Trainer" in flight at Woodford Aerodrome. Welded steel tube construction is employed in the tail unit of the "Avro Trainer." 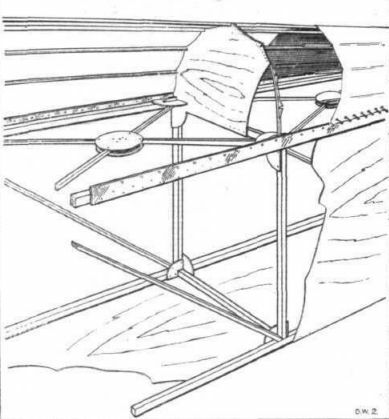 The tail skid is a leaf spring, carrying a chilled cast-iron shoe. 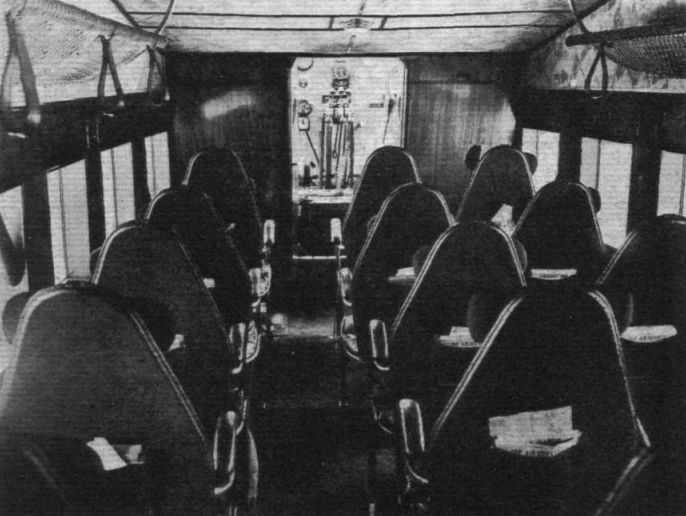 THE "AVRO TRAINER": This part-sectioned Side Elevation shows the general characteristics of the structure and the placing of seats, etc. 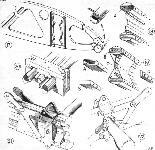 THE "AVRO TRAINER": Some constructional details of the fuselage. The locations of the different joints, etc., are shown in the key diagram. Figs. 1 and 2 are "inside" and "outside" views of the cross-tube joint on lower longeron at point where wing spar is attached. 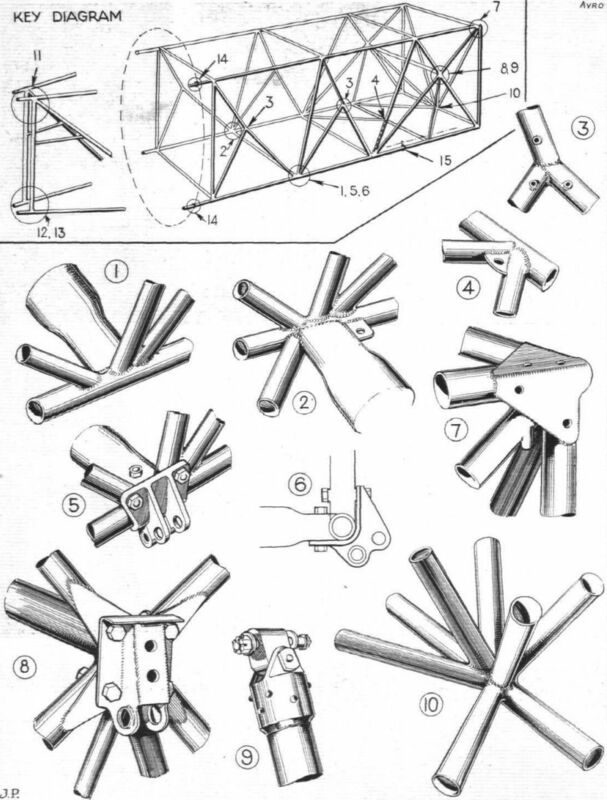 The cross-tube is reinforced internally. Fig. 3 shows a "Y" joint, formed by giving the main tube a "nick," bending and welding it, and welding to the joint a second tube to steady the first at the bend. Another welded joint is shown in 4. Figs. 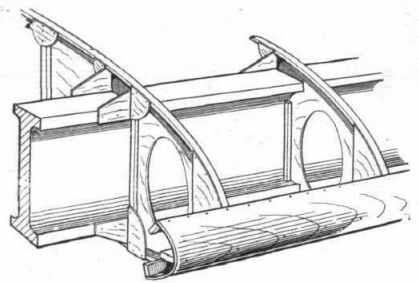 5 and 6 show the lug (forging) by means of which the lower wing spars are attached to the lower longeron. This lug is attached to joints shown in 1 and 2. The joint at the top front corner of the fuselage is illustrated in 7. The fireproof bulkhead and engine mounting is attached here. 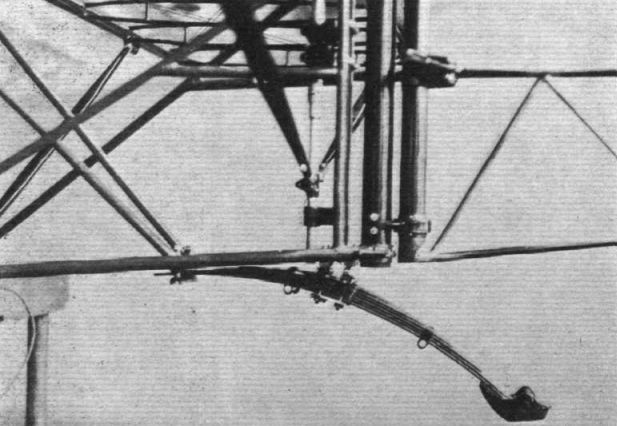 The telescopic leg of the undercarriage is attached to the point of intersection of two crossed tubes, by the form of lug shown in 8, the top of the undercarriage leg itself being shown in 9. On the bottom cross-tube in the front of the fuselage the apices of no less than three vees meet in a welded joint as shown in 10. MORE "AVRO TRAINER" FUSELAGE DETAILS: 11, 12, and 13 are dissected views of the sternpost, which is formed by two vertical tubes. 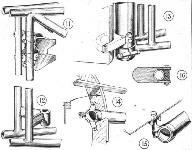 The upper fitting for the tail trimming gear worm and wheel is shown in 11, and the lower, welded-on bracket at 12. To the ends of the longerons are welded split collars which carry the fin post, as shown in 13. The rudder is hinged to the fin post and carried on ball bearings. The casings over these bearings contain shaped felt pads soaked in lubricant. 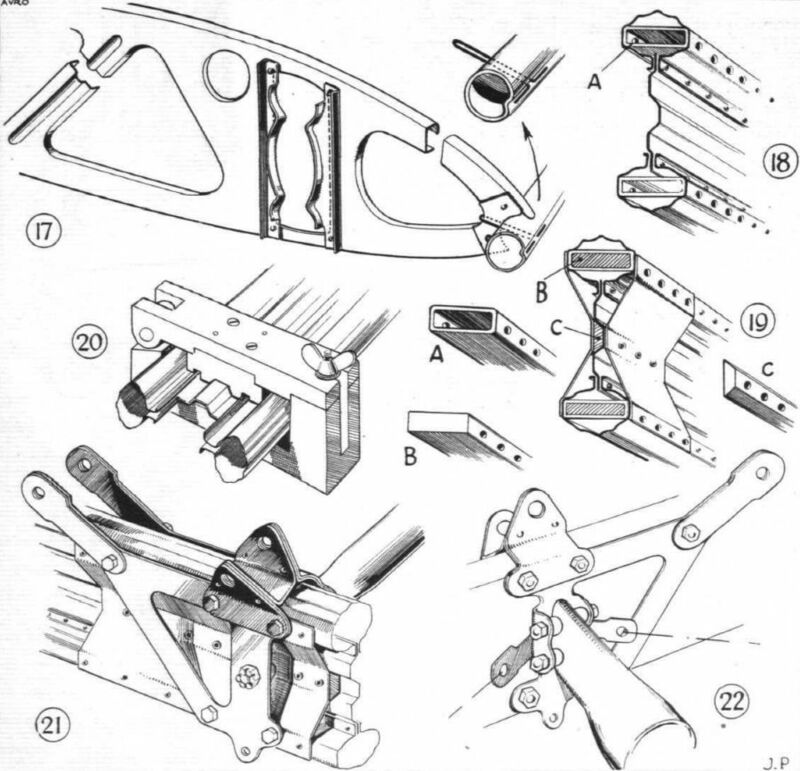 The wooden fairings are attached to the longerons by neat clips, as shown in 14. 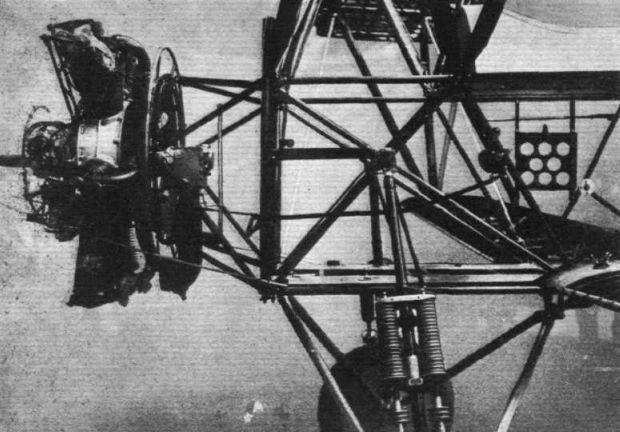 The Duralumin floor of the cockpit is supported as in 15. 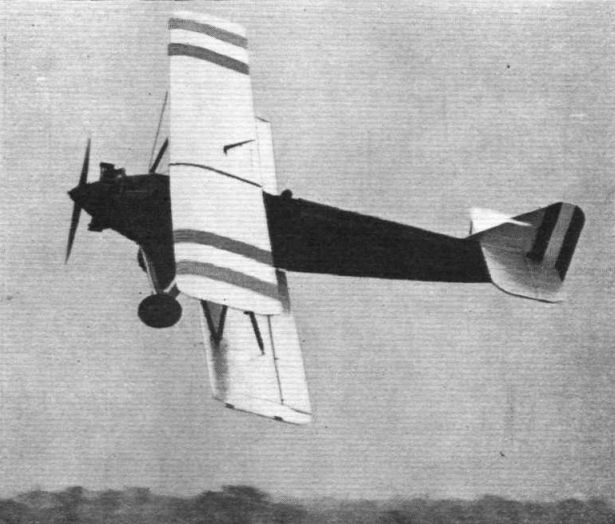 Lighter controls such as throttles, tail trimming gear, etc., are mounted on the fuselage tubes by a neat clip like that illustrated in 16. THE "AVRO TRAINER": Some wing details. The rib construction is illustrated in 17. A main spar section is shown in 18. Note the flattened tube and aluminium block reinforcement of the spar booms for attachment of interplane strut fittings. Further details of this are also shown in 21 and 22. In Fig. 20 is shown one of the jigs used while riveting up the spars. IN PRODUCTION: Many visitors were interested in the new D.H. "Puss Moth," shown in the machine park. 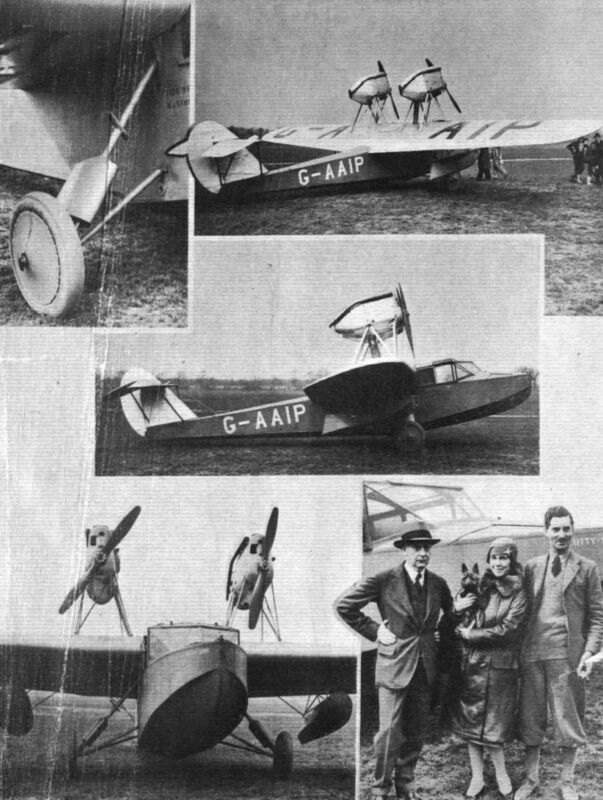 "PUSS IN BOOTS": The De Havilland "Puss Moth" (Moth Three) with inverted "Gipsy III" engine, has now been put on floats. Last week one of these machines was flown from Rochester to the Welsh Harp by Capt. Broad. The floats have been made by Short Brothers. Packard Diesel engine installed in Stinson machine. AIR TRANSPORT AND MINING: We reproduce here a snapshot received from a Canadian reader, showing two Stinson Detroiters and a Fairchild 71 (CF-AHC) belonging to the Consolidated Mining Co. of Canada, Ltd., at their winter base, Prince Albert, on the Saskatchewan river. 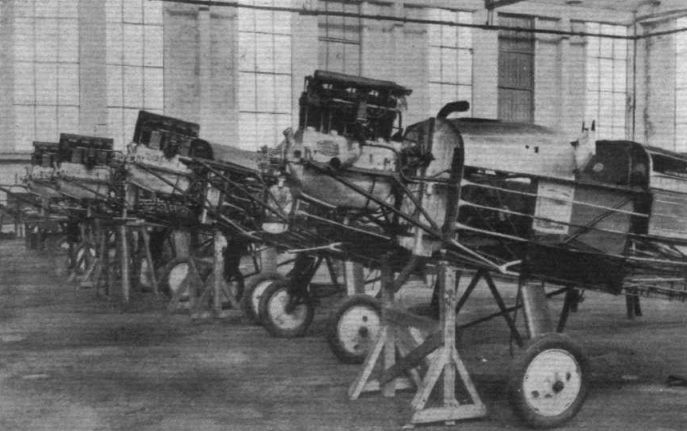 WELL EQUIPPED "AVIANS": A group of five "Avians" equipped with Goodyear Air-wheels and Handley-Page slots, ready for delivery by the Ottawa Car Co., the Canadian licensees for A. V. Roe, Ltd.
A "NEW NOTE" IN BRITISH AIRCRAFT DESIGN: The "Meteor," just completed at the Cowes works of Saunders-Roe, owes its inception to Sir Henry Segrave. It is a four-seater monoplane fitted with two "Gipsy III" engines. The first machine is of all-wood construction, but subsequent ones will have metal fuselages. Clean aerodynamic design has been one of the objects, as well as a high performance. INVERTED DESCENDING! 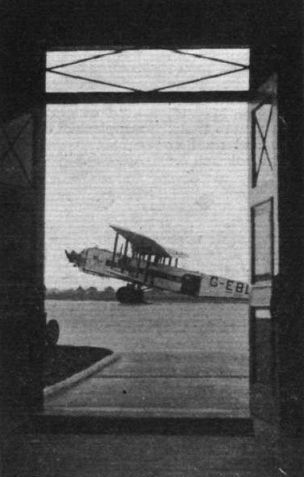 Mr. John Tranum makes a well-timed shot for the centre of the aerodrome at Sherburn. ENTERPRISE! Auto-Auctions, Ltd., the Bluebird agents, have fitted this Machine with the new Goodyear Air Wheels. HATCHING BLUEBIRDS: Our picture shows a batch of Blackburn "Bluebirds" coming through the Saunders-Roe works at Cowes. These machines are equipped either with "Cirrus" or "Gipsy" engines - that nearest the camera having the latter. Our photographer has caught a Blackburn Dart as well as the Glorious at anchor. The Dart torpedo-bombing aircraft is still used in some carriers, but it is being replaced by Blackburn Ripons. Flying Officer Snaith, on the Comper "Swift" taxying into the machine park after giving an excellent display of flying (as seen above). 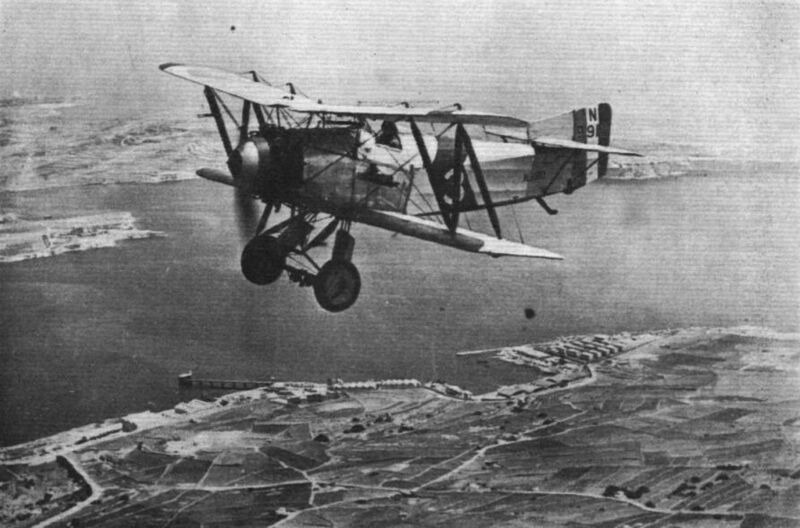 THE FLEET ABOVE: A Fairey Flycatcher (Jaguar engine) flying over Malta. Below can be seen the hangars of the seaplane station. 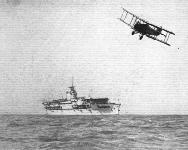 A further selection from a cinema film, in this case showing a Flycatcher which landed and then got caught in a gust and slewed toward the ship's side before the landing crew had time to catch it; it was then righted, wheeled forward to the lift and sent down. 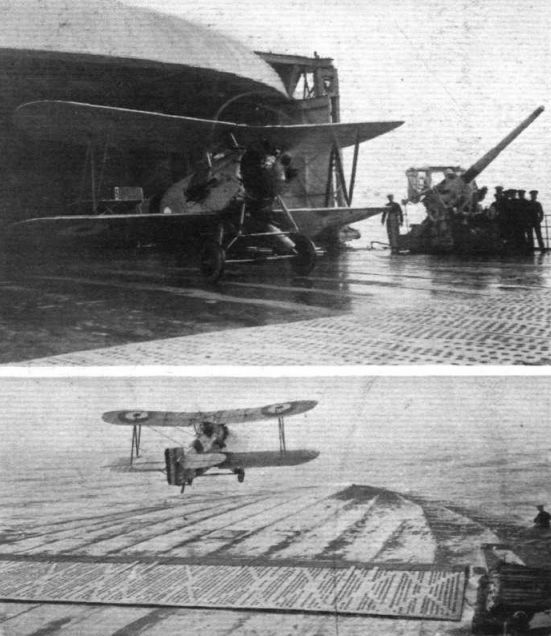 These three photographs also form a series, and are arranged to show the process of getting the aircraft down by the lift. 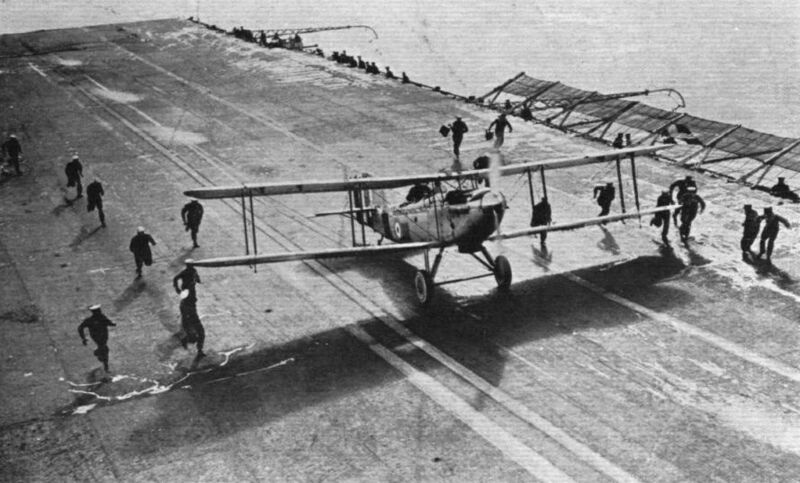 These lifts are situated one forward and one aft of the flying deck, and are large enough to take the III F when the wings are half folded. The fighters can, of course, be lowered as they are, owing to their comparatively small span. 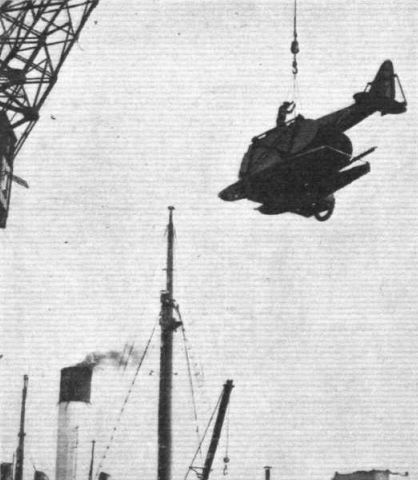 The top photograph shows the Flycatcher being wheeled on to the lift. It should be noted that the wind-screens are raised both at the side and in the front. These screens are raised when the wind interferes with such work on the flying deck, and are lowered again when flying continues. In the second picture, the lift has gone down a little, and the size of the platform can be seen. The bottom photograph was taken from between decks, and shows the lift about half-way down with a Flycatcher on it coming down. Beneath the lift, and forward of it, are other machines of the flight which have already been housed in the hangar. 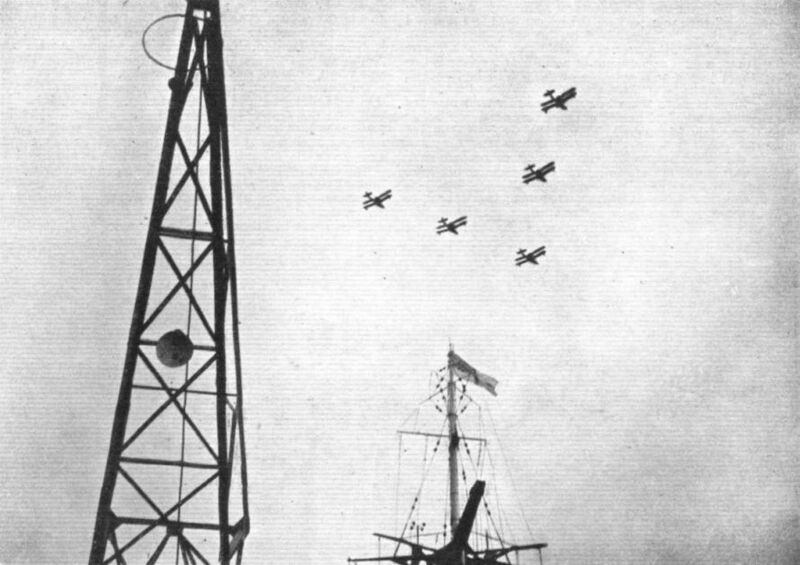 Three Fairey III F's and three Fairey Flycatchers lined up on the top flying deck. Here again one can get a good idea of the size of this deck, and can see that the landing and taking-off space available is considerably larger than many of the landing fields used by some of our joyriding firms who operate without a constant wind speed over their fields such as can be provided here at will. A Flycatcher just emerging from the upper hangar and starting to fly off. 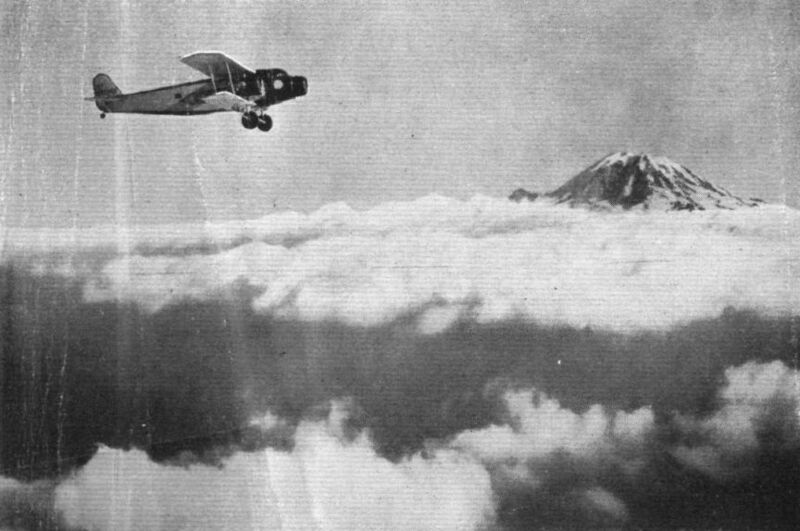 The distance required to take off can be gauged from the fact that in the top photograph the aircraft is just reaching the wind screen, while in the lower picture she has already well cleared it. When taking off in this fashion, the engines are, of course, run up in the hangar while the mechanics hold the aircraft back. 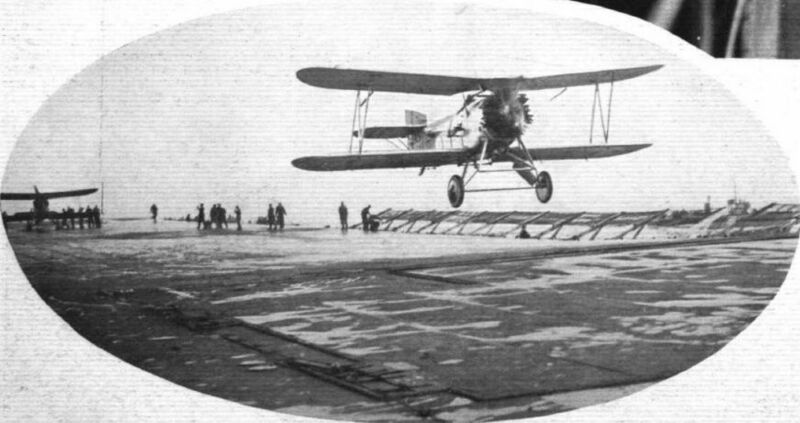 A Flycatcher taking off from the flying deck, just as it has cleared the forward windscreen, which can now be seen laid prone, and flush with the deck, thus allowing the aircraft to take off over it without damage to their wheels. Another point to notice in this photograph is the steam jet. This jet comes from a steam pipe which opens right in the bows of the ship, and it serves to tell the navigator when the ship is heading directly into wind; this he does by altering course until the steam is going aft over the deck parallel to the landing lines. 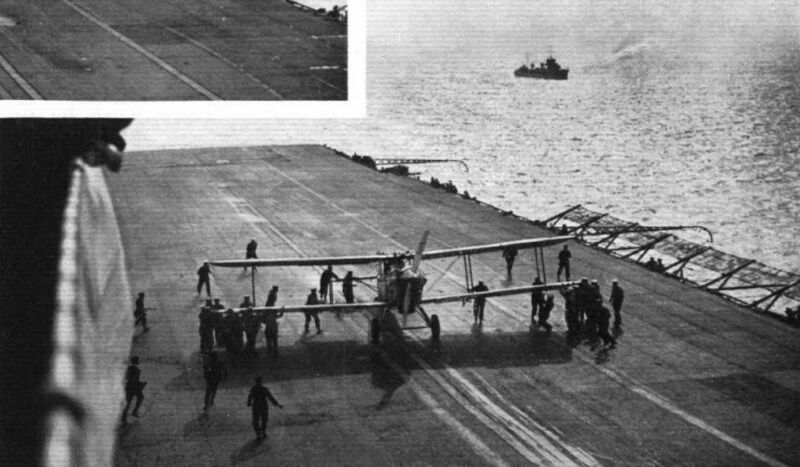 A view taken from the bridge, of a Fairey III F just landing on the deck. Astern is the destroyer which always stands by when any flying is in progress; at the side of the deck can be seen the aerial masts now in the lowered position, and also the landing crew standing on the platforms at the side of the deck ready to jump up and hold on to the machine as soon as she comes level with them. In front of the aircraft are the white guiding lines on the deck between which it is always endeavoured to land, and thereby ensure that the best use is made of the width of the deck and also minimise the danger of going overboard or hitting the funnel. A III F is landing. A Fairey III F landing. 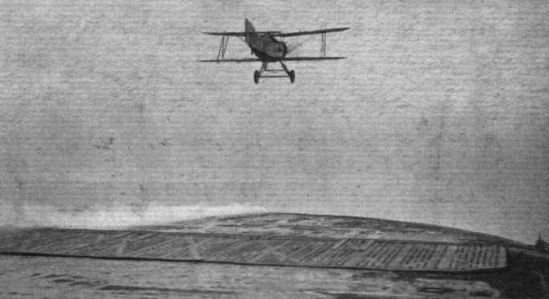 The landing crew are just running out to hold on to each wing tip, and thus prevent the aircraft slewing toward the ship side. This would not necessarily mean a disaster, as right on the right will be seen the wire netting pallisades which prevent a machine from actually falling into the sea should she slew round. The series is taken from a cinema film, and are really self-explanatory. 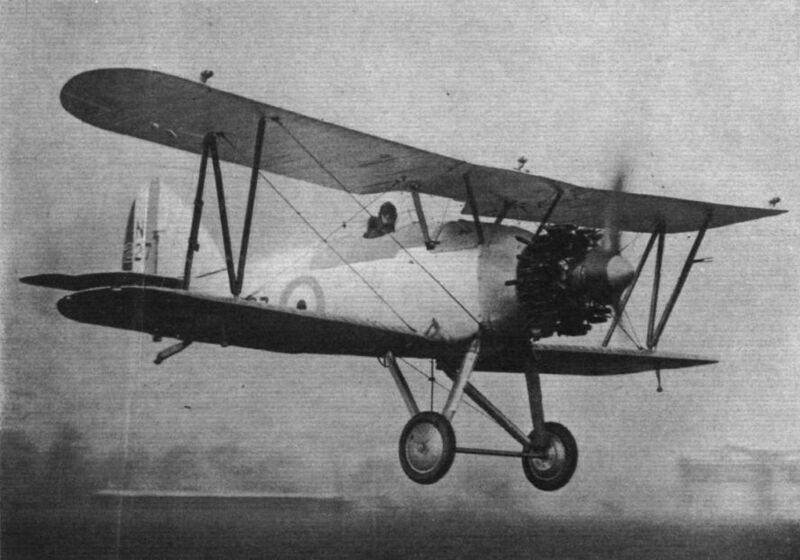 The Fairey III F can be seen approaching and finally landing. A PRIVATE OWNER'S AIR YACHT: The Hon. 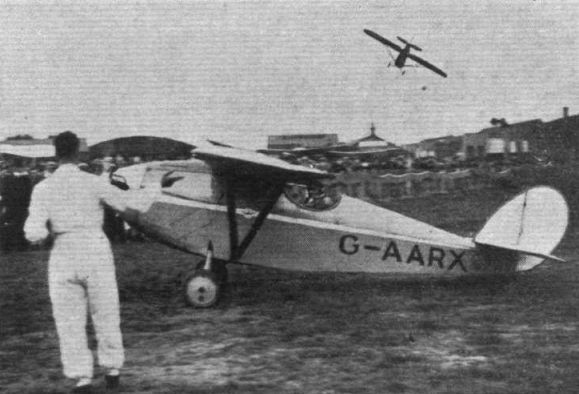 A. E. Guiness now owns another air yacht, a Saunders-Roe "Cutty Sark," which we show here, about to set out from Cowes on a trial flight. We show a selection of views of Mr. Norman Holden's "Cutty Sark." The clear view forward from the cabin can be seen, as also the wide track of the undercarriage. 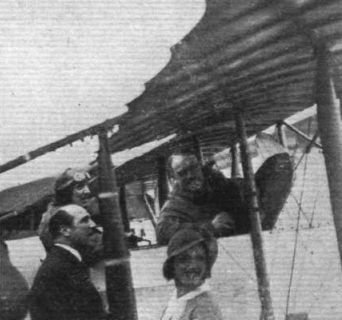 On the right is Mr. Holden, Mrs. Holden and Mr. E. Hordern (pilot). The illustration shows the F.IX. 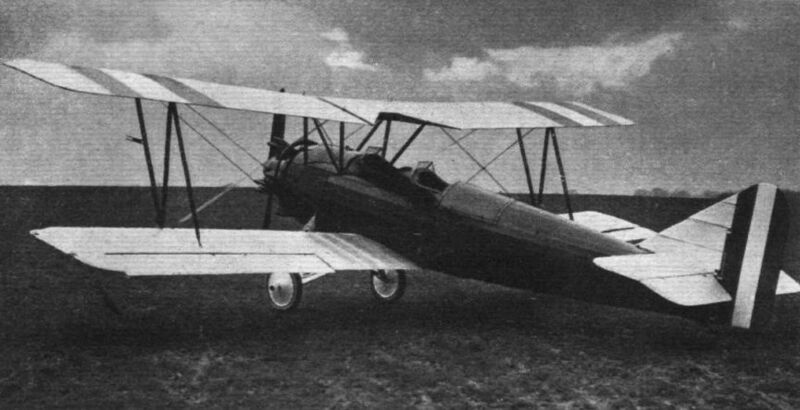 in three-quarter front view. The people walking about near the machine give a good idea of the size. 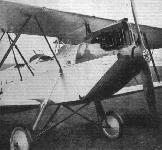 THE FOKKER F.IX. This machine has recently been put on the England-Holland service by the K.L.M. 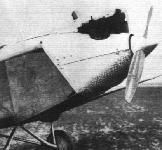 Three-quarter rear view of the Fokker F.IX. Nose of the F.IX. : The engines are "Jupiters" of 500 h.p. each. Note the windows around the pilot's cockpit, which give protection without loss of view. The undercarriage is of the usual Fokker type, with numerous endless rubber rings as the shock-absorbing medium. Wheel brakes are fitted. A view into the luggage compartment, which is exceptionally roomy. 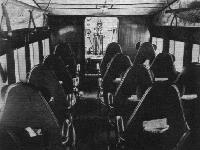 COMFORTABLE FLYING: The passenger cabin of the latest type of machine, Fokker F.IX with 3 Bristol "Jupiter" engines, to be put into service by the K.L.M., line has ample leg and elbow room. The leather-upholstered chairs are provided with adjustable head rests, so that passengers can change their position to the most comfortable. THE AIRCRAFT CARRIER IN AUSTRALIA: A Flight of Supermarine - Napier "Seagulls" of the Royal Australian Air Force flying over their Carrier, the "Albatross." 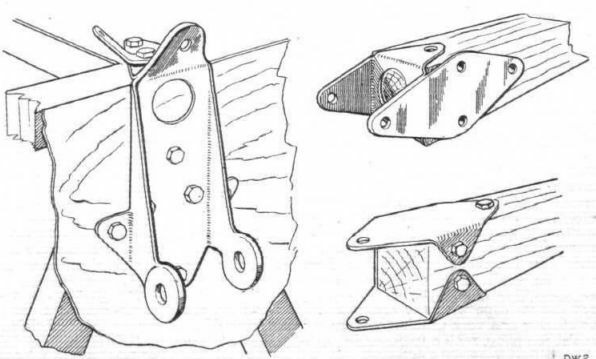 WE show in the accompanying illustrations two views of a new Swiss light 'plane, the "Korsa T2," constructed by Hugo G. Schmid at the Korsa works at Altstetten, Zurich. 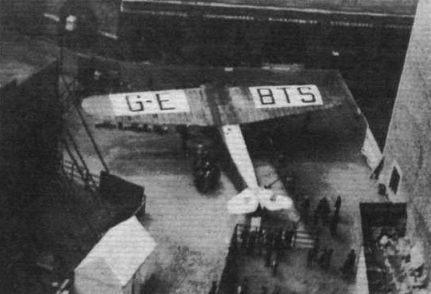 The forerunner of this neat little 'bus, "Korsa 1" (which was described in FLIGHT for April 5, 1928) was destroyed on its first flight, so a model was made and tested in the Mind tunnel at Goettingen. The tests were so promising that "Korsa T2" was built, and Mr. Schmid has already flown it for more than 50 hours with excellent results. 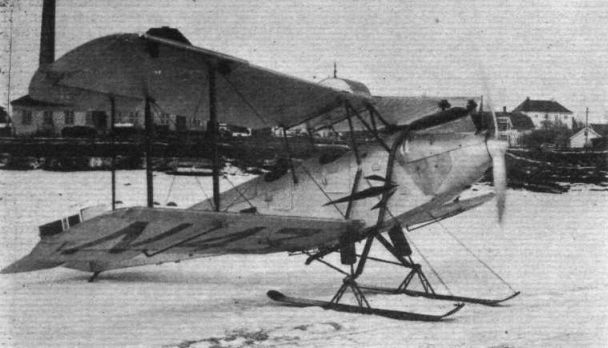 A SPARTAN SPARTAN: The first Spartan to be fitted with skis, in Norway. AT MILAN AERO SHOW: The Breda stand. 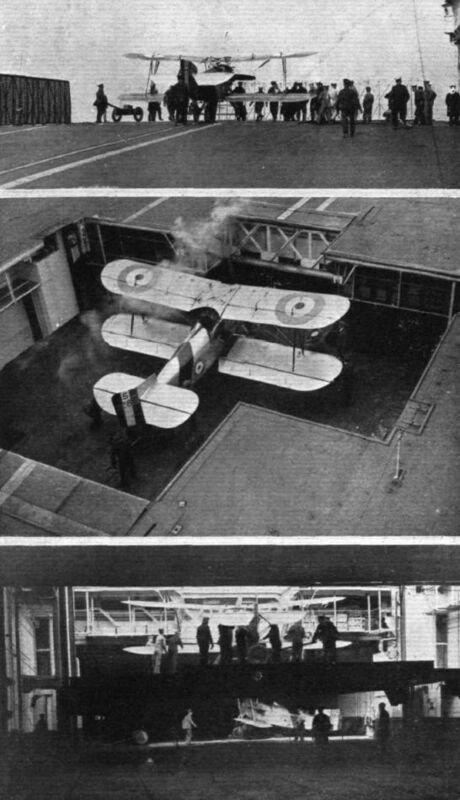 Here was the very neat "Breda 15" light seaplane. Mr. and Mrs. Norman are receiving a glass of "Vin d'honneur" from the officials on their arrival. 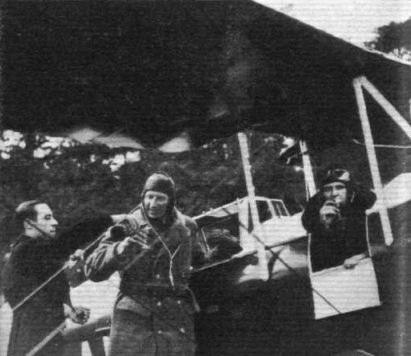 Miss Amy Johnson, of Hull, who left Croydon on May 5 for Australia, piloting a D.H. "Gipsy-Moth." 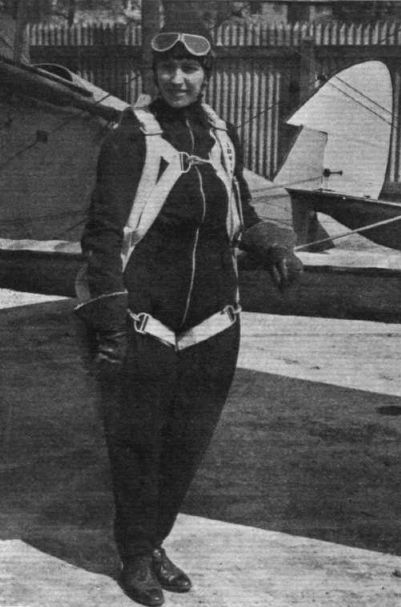 Miss Johnson, who is the only woman to hold an Air Ministry ground engineer's licence, hopes to beat Bert Hinkler's record of 15 1/2 days for the journey. A SHELL MOTH IN AUSTRALIA: F/O. Owen hands over the log books of the Shell Go. 's new Moth to the General Manager, Mr. O. Darch. 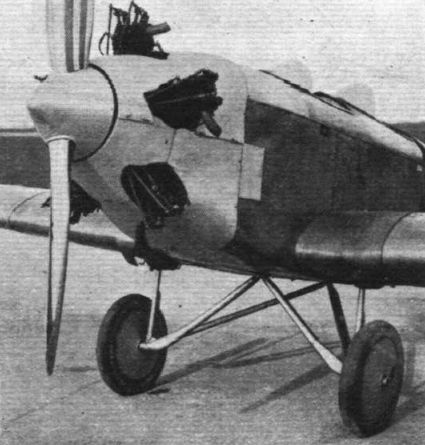 Side and three-quarter rear views of the D.W.2. 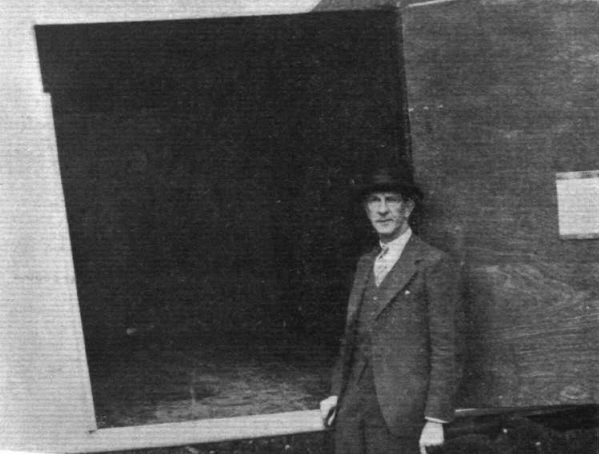 Mr. Dudley Watt demonstrates his new training 'bus, the "D.W.2." 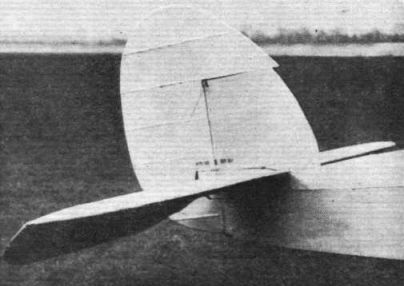 The Tail Surfaces of the D.W.2 are of generous proportions. 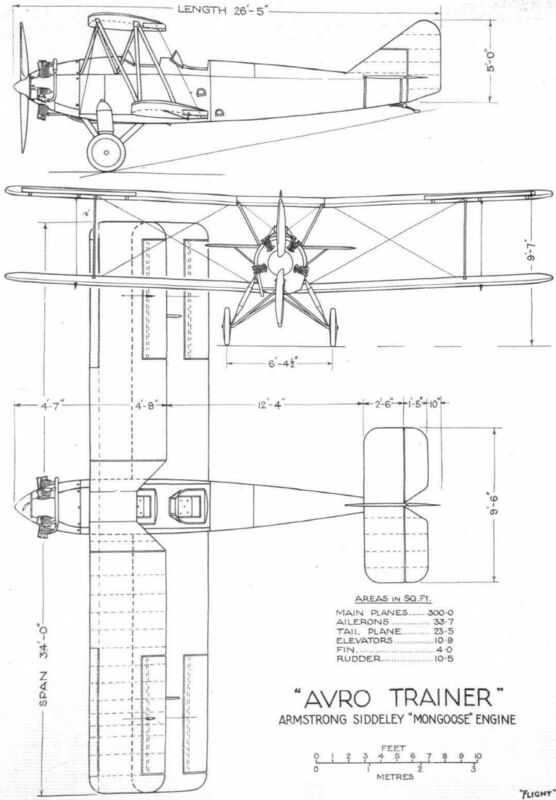 The wing construction of the D.W.2 is very simple. Note that the spar depth is smaller than the overall rib depth. 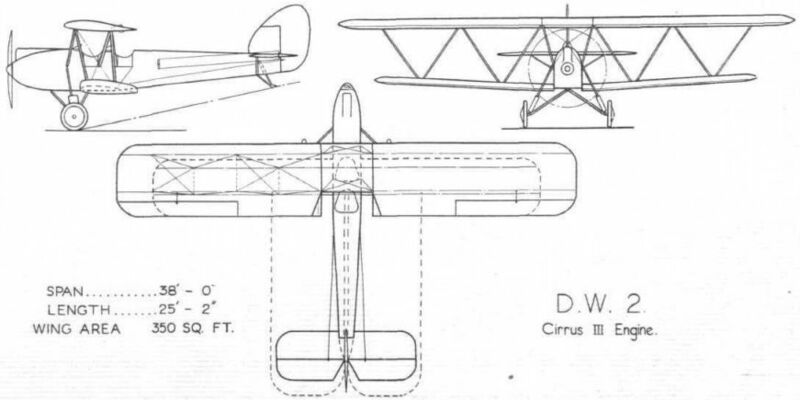 THE D.W.2: On the left, a general sketch showing wing construction. On the right, one of the interplane strut fittings on the main spars. 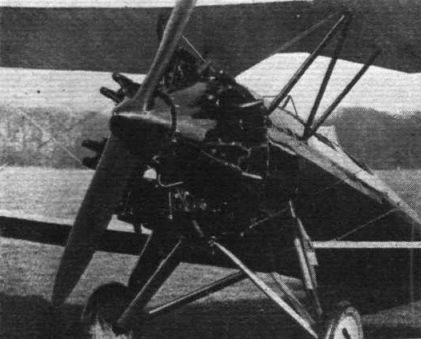 On the left is shown the fitting on the fuselage which takes the telescopic leg of the undercarriage and the forward centre-section strut. 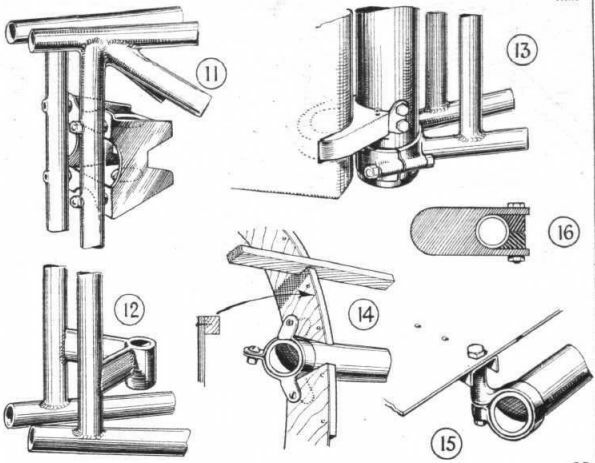 On the right are shown the two types of spar end fittings used. THE PRUFLING: Mr. Alan Goodfellow flying the Lancashire Club's new glider. 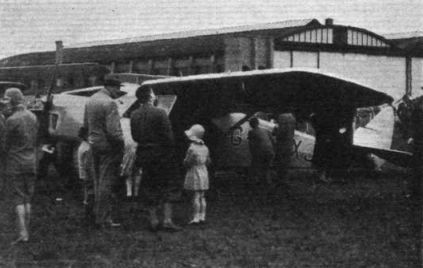 A MIDLAND GLIDER: The Glider of the Midland Club about to be launched.